Crane Elephant Cool Mist 1 Gallon Child's Humidifier. While humidifiers are one of the best ways to relieve nasal congestion during cold and flu season, most people don’t break into a smile about the traditionally unexciting appliance. 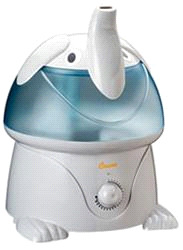 Crane USA Inc. is proud to introduce their uniquely designed adorable animal shaped cool mist humidifiers. Crane realizes that more than ever before people are looking to improve their health and their home environment. Crane is a company that recognizes these health concerns and people’s individual lifestyles. If you have any questions, please give us a call at (701)223-9936 or Toll Free (800)355-2956.